This is Day 4 of the 5 Days to a Better Grocery Budget series. If you missed the previous posts, read Day 1 here, Day 2 here, and Day 3 here. So far in this series, we’ve talked about: how there is no one right way to set up a grocery budget, how much you should spend on groceries, and how to track how much you’re spending. Today, I want to tackle one of the most important parts of sticking with a grocery budget… namely, how to actually stick with it! You can have all the best intentions in the world, you can set up an amazing grocery budget, and you can create a really good accountability system, but if you don’t actually follow through with it, you’ll never be successful at grocery budgeting. Before we talk about some practical tips on how to actually stick with your grocery budget, I want to first address three things I don’t want you to do. Because if you do any of these three things, it could keep you from being successful in following through with your budget. Here’s the deal: You can sit there and make excuses or you can get up and do the best you can do with the situation you’re in and the income you have. It’s your choice. If you need encouragement for setting up a grocery budget — even if you have a weird or difficult current life situation — be sure to read the comments on this post where folks all over the country tell about where they live, how many people are in their family, and what their grocery budget is. I think it will really inspire you. You can do this, too! Nothing’s stopping you from success except your own excuses! Remember, if you’re brand-new to budgeting, you will make mistakes. You will probably find that there are times when it’s more difficult than you think it should be. You will probably go over-budget some in the beginning. This is normal. This is how you learn and grow and get better. When you make a mistake, don’t beat yourself up. Don’t call yourself a failure. Don’t throw up your hands and decide that this grocery budgeting thing isn’t for you. Remind yourself that this is part of the learning curve, think about what you can learn from you mistake, and consider what you need to change or do differently so you don’t make the same mistake again. And then give yourself grace and get back in the game! You will likely need to tweak the budget as you go — especially if you are new to budgeting and just picked a number that you think will work. As real-life happens and you are actually trying to stick with this number that you had initially thought would work, there’s a good chance you’ll find you need to change it. That’s totally okay and acceptable. In fact, I always tell people that it usually takes 3-6 months when you’re brand-new to budgeting to really figure out what a good number is. Tweaking is part of the process! In addition to the initial tweaking, you’ll also want to tweak your budget as your needs and your family changes. As time goes on, if the number you have chosen just isn’t working and is making your life miserable, it’s 100% okay to tweak that number again. Like I said earlier in this series, a good grocery budget is one that works for you and your own family. So be sure to regularly re-visit the number you’ve chosen to see if you need to change it. We’ve significantly increased our budget the past two years because that is what was best for our family. I don’t feel guilt about that. Instead, I’m grateful that we can do what is best for our own family and that we’ve found a grocery budget amount that works best for us right now. Plan Your Menu With Your Budget In Mind — Think about how much items cost and keep this in mind when you are planning your menu. If you have no idea, start keeping a price book to help you learn the general prices of items so you can better gauge how much the recipes you’ve chosen on your menu plan are going to cost. Use a Calculator At the Store — One simple way to save money on your grocery bill is to always bring a calculator with you when you shop. Since I use cash when I shop, it’s important to keep a tally of how much I’ve spent so far so that I don’t get up to the register and not have enough money to pay for my groceries. Keeping a running total also encourages me to carefully evaluate all purchases as I put them into my cart — and it helps ward off the temptation to make impulse purchases on things I don’t really need to buy. 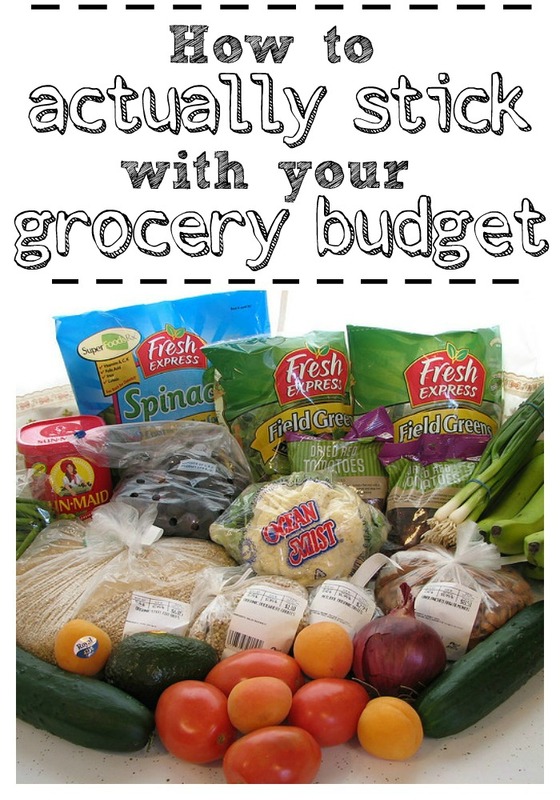 What help you to stick with your grocery budget? Do you have any great tips or tricks? I’d love to hear! We ALWAYS plan our weeks menu and make a list before going shopping!! This helps us the most to not just go in and buy whatever!! First thing I do is pray and ask God to help me stretch my grocery dollars. I always stock up when items we always use are at rock bottom prices. I never pay full price for meat or much of anything. Buy produce in season. I cook from scratch 90% of the time. Our family of 4 (2 are young children) budgets $325/month for groceries. That’s just for food. Toiletries, cleaning, laundry, personal care, etc. is another $40/month. We live in the Buffalo, NY area. We shop at Aldi for just about all the food we can, always prepare a shopping list (I keep a running list in a note in my phone that I can just text to my husband if needed), and limit the number of times we go grocery shopping to about once a week. For a while I was keeping track of prices at different stores, but I found that Aldi was the cheapest for just about every single thing we regularly buy. A large part of our toddler’s diet is steamed veggies- we get most of those frozen in bulk family size bags at Wegmans. As a kid, when I went grocery shopping with my mom, she’d have me add up the groceries in my head as we went. My total didn’t have to be exact- just ballpark. (I had to do math each day in the summer when school was out, and this exercise counted as my daily math!) I guess this isn’t really a budgeting tip, but it’s a way to get school-aged kids involved in the process. Thanks for sharing! This builds skills in multiple areas at the same time! I wrote a post a year and a half ago about doing this with one of my students. The grocery store can also be used for strengthening reading skills as well as math skills. When money is tight and I really need to keep the budget, I calculate how much it is going to cost before I step foot in the store. So, for example, I easily can add up anything that I’m going to buy from the store flier and then add in the average prices for the other items. If I’m over budget, then I know I need to cut down my list–maybe stock up less of something, skip a treat, or substitute something. Then, when I go to the store, I know that I need to only buy exactly what is on my list–and nothing more. Another way to stick to your budget is when you meal plan or need certain items from your favorite grocery store (or stores) check their online or paper flyer for their weekly sales and build your list from that. I do this before I shop and it really helps you save. If your store has a “perks” program or loyalty program sign up for that and with the store I use I can “cut” coupons from their website and it is tied to my cell number and I then have savings on the products I buy. Happy savings! 1. Clean out my fridge. This way I know what I actually have and what I need. It never fails to amaze me what I forget about. 2. Do an inventory of what I have in the pantry and the refrigerator. I try to plan my menu based on what I already have in inventory. 3. Check my calendar so that I know for sure that I’ll have time to cook. Nights that will be tight I plan super easy (and cheap!) meals. Not cooking as I planned is a huge money waster. 4. Don’t be afraid to repeat. We love changing up our meals but sometimes an ingredient that you need is enough to make a couple of meals. When I make Chicken Parmesan we always have it two weeks in a row so that I can use up the block of mozzarella cheese. Oh! These are such great tips! Thank you for taking the time to share! My husband and I live in Northern Virginia about 45 minutes outside of DC and it is super expensive. I work midnight shift and he works days so when we got married and I started having to cook meals it was very challenging because I just did not feel like cooking between shifts and we were spending a fortune on eating out because it was easy. Then a few months ago it just clicked for me. Hello crock pot!! It has made life so much easier. I used to shop 1x/week and was spending about $100/week on groceries including my husbands energy drinks (those things are so freaking expensive!). Then his car went out and we went down to 1 car and it was just easier to go 1x every 2 weeks. I drop him off at work on a Saturday I’m off and just hit up the grocery store right after. My grocery spending actually dropped doing this. I’m now spending about $150 every 2 weeks. I use fresh veggies for the 1st week and frozen along with root veggies that will stay for the 2nd week. I use the left overs or other easy prep foods for his lunches and usually just eat cereal or grilled cheese at home for my breakfast/lunch. Wow! It’s amazing how shopping less means you spend less! Thanks so much for sharing! I very rarely purchase anything that’s not on sale. I shop the sales, price match at WalMart &/or HyVee, & stack coupons on top of those sales whenever possible. I stock up based on the sales, & often freeze produce, meat, milk, cottage cheese, ricotta, & cheese before it goes bad. I don’t menu plan before I shop. I menu plan from what I already have in the pantry, frig, & freezer; & do a lot of freezer cooking. My budget is $80 or less for one & I’ve had $40 months several times. Breakfast is almost always oatmeal. I asked a local grocer, who sells bulk oats, if they would give me a discount if I purchased an entire bag & was given a 15% discount. I froze most of it in one gallon ziplocks, so it stays fresh. What size bag of oats did you have to buy to get the discount? 50 lbs? I got 50 lbs for around $33 (about $0.66/lb + tax. It’s been a while since I purchased it, but at the time it was cheaper than Aldi’s per lb & the store’s bulk price was $0.79/lb. She said they had just changed vendors & used to get 25 lb bags. They ordered it for me, it took about two weeks for them to get it in, & I paid when I picked it up. It never hurts to ask. I’ve been loving this series! I’ve been using cash for our groceries for a few years now and it really helps stay on budget. I love your reminder about not feeling guilty if you make a mistake. That is so true! Once I went over by $12 and I was so upset. In actuality, it was only $12 and the 1st time I’d overspent. Give yourself grace! And also your reminder to revisit the grocery budget to make sure it is doable for your family is a good one! I’m thinking that our budget needs to go up a little bit as my 15 month old is eating more and we are practicing a lot of hospitality. Thanks for the tips! Thanks so much for your kind encouragement! I’m so glad you’re loving the series! It’s been fun for me to write! Crystal, how do you use a calculator at the store? I have tried to use one in the past, but always seem to accidentally hit another button and lose my total. I have tried saving the sum to memory, but that gets lost too. I have tried adding a ballpark total on my paper grocery list. That has worked with some success, but I it was too much hassle and I gave up. Thanks for a great, practical series! One thing I’ve done is to write down my total every few items on my grocery list so in case something happens and I lose my total, I don’t forget or lose what it was. When I make my list from the ads, I add my totals to my grocery list so I know exactly how much I will be spending since I stick to my list. Crystal already replied, but a good idea to help with keeping track at the store: if you make your list ahead of time, add a ballpark amount to it (i.e. milk $4), then when you cross of your item, mark how much it actually is and add any non list items to the bottom the same way. You will have a pretty ballpark amount and know if you’ve spent/are spending too much long before the register. oats, beans and lentils, rice (or brown rice), carrots, potatoes or sweet potatoes, cabbage, zucchini, bananas, eggs, chicken thighs, and canned fish, as well as apples, oranges, and pineapples in the right season.